First, allow me to introduce myself: I am a graduate student in my third year of study at the Winterthur/University of Delaware Program in Art Conservation (WUDPAC). My background is in decorative painting and conservation of large-scale objects, and at WUDPAC I specialize in the conservation and analysis of Painted Surfaces, particularly those in the built environment. In my studies, Patrick Baty’s name came up often due to his contributions to the field, and I found that his articles, blogs, and other publications were my most important resources in understanding this complex and fascinating discipline. When it came time to arrange my summer internship, I knew that I wanted to come to London to work with Patrick and learn from his expertise in paint analysis and how he runs a successful paint shop and consultancy. I was also hoping to learn first-hand about British paint and design traditions (from which our American traditions spring), as preparation for the next stage of my studies- as an architectural paint analyst / intern at Colonial Williamsburg, Virginia. Be careful what you wish for! Under Patrick’s tutelage I’ve had a fabulous introduction to the busy life of an architectural paint researcher. We’ve done everything under the sun (and sometimes rain), visiting sites of historic and architectural significance to which Patrick has personally contributed through his knowledge of colour and paint. The range is really quite staggering! 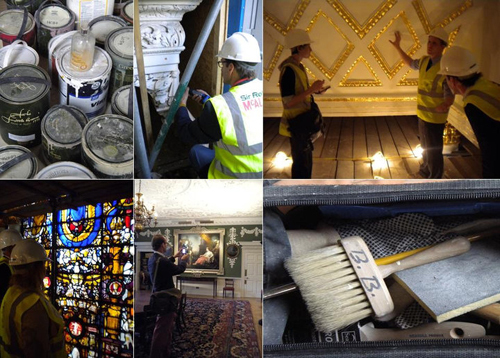 On a “typical” day, we might don hard hats and steel toed boots and climb scaffolding to inspect a gilded cathedral ceiling, or take samples from a painted exterior at Queen Anne’s Gate. Then off to a meeting with architects who want Patrick’s expertise in restoring the colours of a plush 1930’s hotel, then take a bus across town where an organization needs to know the correct shade of blue that would be historically appropriate for a row of townhouses. Throughout the day, we would “pop in” to museums, churches, and historic houses where Patrick had worked in the past (there is always one a stone’s throw away anywhere in the city). 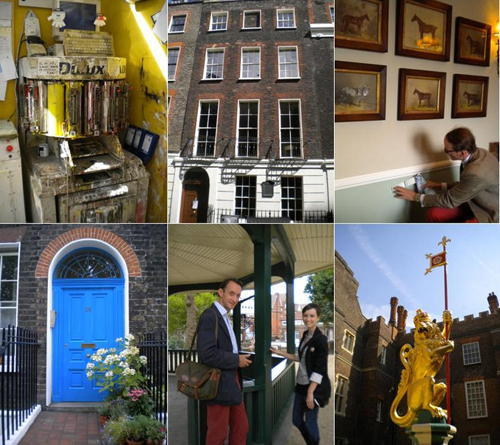 Sites included the Geffrye Museum, the Benjamin Franklin House, the Foundling Museum, and Royal Festival Hall (to name a few). 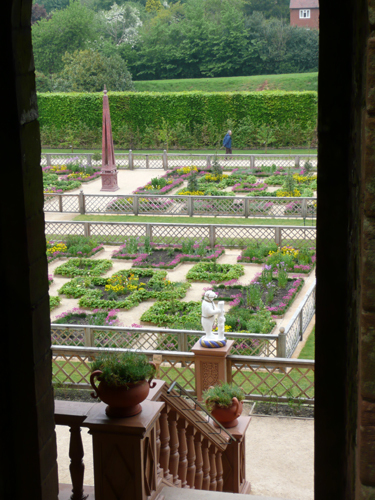 As we walked across grand dining rooms, up winding staircases, or into humble servant’s quarters, Patrick would explain to me the history of the site, the goals of the paint analysis, his findings, and his thoughts on the final interpretation. I always had a million questions, and Patrick thoughtfully and patiently answered every single one. This constant dialogue was a real joy to me. It was wonderful to be in an architectural space discussing paint traditions and colour history with someone so knowledgeable and enthusiastic about the subject. This was exactly the kind of thing I had to leave the classroom to learn. I also had the opportunity to help Patrick take samples on-site, and prepare them for examination and documentation at his home laboratory (with help from his other assistant, Caspar the cat). Patrick’s microscope is hooked up to a television screen, which allowed us to look at samples together and discuss what we were seeing. This was another important aspect of my internship- as sampling, microscopy, and report-writing are crucial skills required for any paint researcher. Wait, my four weeks is up? But we’ve only just gotten started! Well, time to pack my bags again, for the last time. This has been an incredibly successful summer for me, and I feel so fortunate to have had this opportunity to work with Patrick here in this great city. Now that I know how busy he is, I really can’t believe how much time he took from his own schedule to show me so much of London! I truly, truly appreciate it. I’ve learned everything I had hoped to and more, and I’ll put all of this knowledge to good use back home. I hate goodbyes, so thank goodness we’ll be able to keep in touch via facebook and Twitter! Best of luck with all your future projects, and a big Happy 50th Anniversary to the best paint shop in the world! Don’t forget breakfast at the Chelsea Arts Club, Kirsten! Click for more information on what I do. I love London and have been to so many of the places you described. How envious I am of the valuable internship you had! It sounds fascinating and I'm sure you learned many valuable things that the classroom just can't give you. Best of luck!